Barnes and Noble has announced the second and final tablet they intend on releasing in 2015, the Samsung Galaxy Tab E NOOK. This 9.6 inch model is available right now and is retailing for for $249.99. The budget friendly Samsung Tab E Nook features a giant 9.6 capacitive touchscreen display with a resolution of 1280 x 800 with 157 PPI. It has 1.5 GB of RAM and 8 GB of internal memory. It does have an SD Card, so you can enhance it up to 128 GB. The tablet is powered by a fairly respectable 1.2 GHz Qualcomm APQ 8016 Processor. If you are interested in taking selfies, you can do it with the front facing 2 MP camera or snap pictures with the rear facing 5 MP model. It is powered by a non-removable Li-Ion 5000 mAh battery. The Nook Tab E is Android KitKat, instead of lollipop. Users will be able to download apps from Google Play, the Samsung App Store or the Nook App Store. There are a series of customized Nook apps that are available when you take it out of the box for the first time. You can read digital magazines, shop and read e-books and manage your entire Nook library. For previous NOOK customers, Barnes & Noble is offering a great limited-time promotion to help them trade up to a new NOOK by Samsung. Through November 7, customers can visit any Barnes & Noble store to trade in select NOOK devices and receive a $50 credit towards the purchase of a new NOOK by Samsung. Participation in this promotion reduces the cost of the 9.6-inch Galaxy Tab E NOOK to $199.99, the 8-inch Galaxy Tab S2 NOOK to $349.99 and the 7-inch Galaxy Tab 4 NOOK to a remarkably low $99.99. NOOK trade-ins may include NOOK 1st Edition, NOOK Color, NOOK Tablet, NOOK Simple Touch, NOOK Simple Touch with GlowLight, NOOK HD, NOOK HD+ and NOOK GlowLight. Customers can also trade in select iPad, Kindle and Samsung tablets to receive a credit of $25-$200 towards the purchase of NOOK by Samsung devices. Should you buy this tablet? Fundamentally there is no difference between the stock version of the Galaxy Tab E from Samsung and the Nook edition. $249.99 is a fairly respectable price, but the resolution on this 9.6 model is fairly abysmal. You will likely get a solid e-book reading experience, but it might be poor to read digital magazines, newspapers or watch streaming video. I actually have no idea who this tablet is supposed to be targeting. Barnes & Noble, Inc. BKS, +0.00% today expanded its offering of NOOK by Samsung devices and announced a special promotion to help even more customers trade up to one of its newest tablets at an even greater value. In conjunction with Samsung Electronics America, Barnes & Noble introduced the new 9.6-inch Samsung Galaxy Tab E NOOK, a large-screen tablet features Samsung’s stylish yet practical design with NOOK’s extraordinary reading and entertainment experience, perfect for the whole family and now available at Barnes & Noble stores and www.nook.com for $249.99 including a special free limited-time content offering. Barnes & Noble also launched a new Trade-In/Trade-Up limited-time in-store promotion to offer significant credits of up to $200 towards the purchase of a new NOOK by Samsung to customers who trade in select NOOK, iPad®, Kindle and Samsung devices* through November 7. For previous NOOK customers, Barnes & Noble is offering a great limited-time promotion to help them trade up to a new NOOK by Samsung. Through November 7, customers can visit any Barnes & Noble store to trade in select NOOK devices and receive a $50 credit towards the purchase of a new NOOK by Samsung. 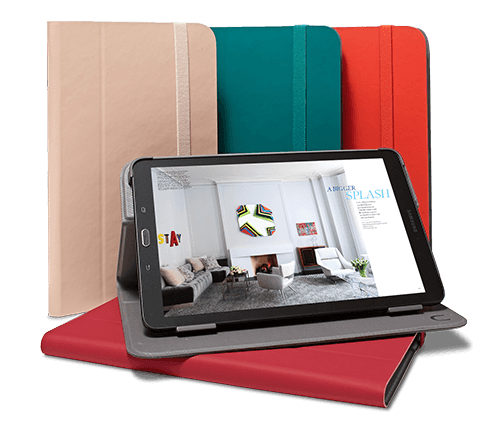 Participation in this promotion reduces the cost of the 9.6-inch Galaxy Tab E NOOK to $199.99, the 8-inch Galaxy Tab S2 NOOK to $349.99 and the 7-inch Galaxy Tab 4 NOOK to a remarkably low $99.99. NOOK trade-ins may include NOOK 1st Edition®, NOOK Color®, NOOK Tablet®, NOOK Simple Touch®, NOOK Simple Touch® with GlowLight®, NOOK® HD, NOOK® HD+ and NOOK GlowLight®. All customers who purchase a new Samsung Galaxy Tab E NOOK or a Galaxy Tab S2 NOOK can choose complimentary NOOK content from Barnes & Noble. This includes three NOOK Books® from a selection of 20 great titles featuring favorites such as The Gravedigger’s Daughter by Joyce Carol Oates, Think Big, Act Bigger by Jeffrey Hayzlett and On A Night Like This by Barbara Freethy, and three NOOK Magazines® from a selection of more than 25 popular publications such as Cosmopolitan, Esquire and Food Network Magazine. Barnes & Noble also provides customers with a $5 credit to help them get started building their NOOK library. This promotion runs through the end of the year. The new Samsung Galaxy Tab E NOOK is now available only at Barnes & Noble stores and online at NOOK.com for $249.99, with an additional 10 percent discount for Barnes & Noble Members. All NOOK devices come with free lifetime in-store support. NOOK customers can visit any of Barnes & Noble’s nearly 650 stores across the country for complimentary, personal support, including help setting up their NOOK device and organizing their library. While in-store, customers can speak with any of the company’s expert booksellers, access free Wi-Fi® and enjoy the popular Read In Store® program, which allows guests to read any book free for up to one hour per day. Customers can also take advantage of a full calendar of popular NOOK events, including NOOK Night workshops, family Storytimes, book discussion groups and author signings. I wonder if they’ll ever get around to actually releasing an e-reader. The B&N brand is quickly becoming that of a Samsung kiosk. Totally! I know that the Nook Glowlight Plus e-reader is all ready to go, the bookseller wanted to get all of their new tablets out of the way first. The tablets sell for a premium price, so B&N wanted to get people buying those first, than a low-cost e-reader. Think you all might want to do some updates to your article since some of the stuff written is incorrect. I just came from my local BN and the device has 16gbs of memory not 8 expandable to 128, and it’s running android 5.1.1 and think that is lollipop not KitKat if I’m not mistaken. They could release both. If someone wants an updated e-ink reader and all BN are releasing right now are tablets – then BN is not going to get any money coming in. And they’re going to start driving (even more) e-ink customers over to Amazon, which is the last thing B&N can afford right now. I have an article ready to be published whenever B&N announces a new e-reader. A big argument I make is how they randomly announce stuff and it goes on sale the same day. They do not tease us in advance and give people a reason to hold-off buying something from the competition. Unless you are a regular reader on our website, you would have no idea there is a new nook e-reader right around the corner. Can you say… Meh? The Nook HD was 8.9 inches and was 1920 x 1280 and cost less than this. that is the funny thing about the samsung tablets, they are a downgrade from almost 2 year old tech. Pretty sure B&N doesn’t, either. Marketing doesn’t seem to be their strong suit and, since they’ve not been developing their own products lately, product development doesn’t seem to be either. So what IS their strong suit? Not website design, clearly. Not e-commerce. Building stores, maybe? You have to wonder how long THAT will keep them in business, don’t you? With a stock price that seems intent on testing all-time lows in the near future, a whole lot of people seem to be wondering about that, too.